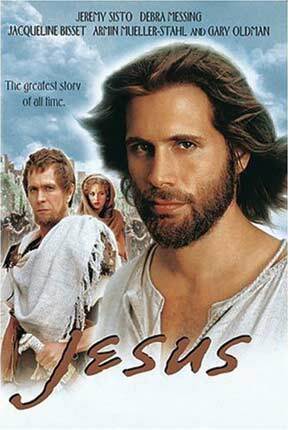 This new television mini-series, which aired on CBS in May 2000, looks at the life of Jesus from His humble beginnings as a carpenter through His extraordinary life and the mission of His spiritual destiny. This is a superb production and should prove very helpful to stimulate interest on the part of a Biblically illiterate generation to want to know more about the Gospels and the extraordinary life, death, resurrection and meaning of Jesus. With a $24 million budget, Jesus was shot on location in Morocco and Malta. This four-hour global television event features an all-star cast including Jeremy Sisto, Gary Oldman, Armin Mueller-Stall, Jacqueline Bisset, Debra Messing, and David O'Hara. It also includes the music of Leann Rimes, Steven Curtis Chapman, Avalon, Jaci Velasquez, DC Talk, Yolanda Adams, Patrick Williams, 98 Degrees, Hootie and the Blowfish, Sarah Brightman, Lonestar, and Edwin McCain.